Watch the mobiREALTOR presentation video to see how the service works. You already have everything you need to get started, and so does everyone else. It's your mobile phone. When a property is just not selling because of limited exposure or because of a few showings, mobiREALTOR brings the power of mobile marketing, GPS and the sophisticated Mobius mobile image recognition technology to help you showcase your property in a new and unique way sure to help you sell it fast. 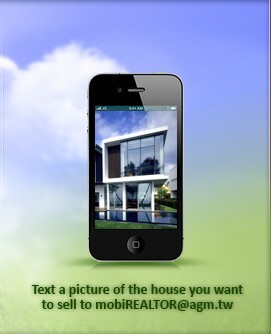 The mobiREALTOR service is costs only $99 per listing, it's easy to setup, and works with any camera-enabled mobile phone or tablet. You shoot your virtual tour on your cell phone, text or email it to us and we will do all the heavy lifting building your mobile mini site.